The new Range Rover Evoque will be available from September and now Land Rover has revealed how much it will cost. The new vehicle has a range of new technologies and design features that will help deliver improved efficiency and bring lower running costs for ownership. The new Range Rover Evoque 2016 model year will feature new four-cylinder Ingenum engines that are EU6 compliant and should return around 68 mpg in the 2WD eD4 model. It’s CO2 emissions are 109g/km. There’s no doubt that Land Rover’s advanced diesel engine will give the Evoque a class-leading combination of refinement, efficiency and performance. Land Rover says this is the most efficient production vehicle they have made yet with the new engine being nearly 30 kg lighter than the one it replaces. Buyers who opt for the more potent 180 PS engine, in the 2WD eD4 guise, will find its fuel economy should be around 60mpg with CO2 emissions of 125g/km. In addition, buyers of the new Range Rover Evoque will find they will have greater opportunity to personalise their vehicle with a range of optional and standard equipment. 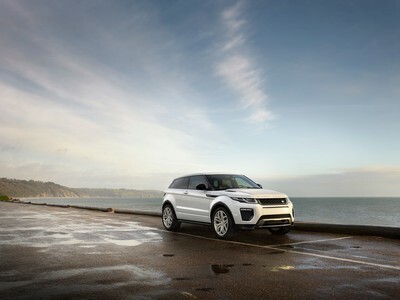 The variants for the Evoque will include the SE and SE Tech, Autobiography as well as the HSE Dynamic and Dynamic Lux. Exterior tweaks include a new grille and front bumpers as well as new LED headlights and a new tailgate spoiler. Land Rover have also use the opportunity to bring in three new designs for the Evoque’s alloy wheels and in the cabin is a new seat design which is made in new materials and colours. The Range Rover Evoque also features a new infotainment system which consists of an 8-inch touchscreen which will give access to driver aids and new applications. Among the additions is ‘gesture control’ which is available and which will enable owners to have hands-free opening of the car’s tailgate. There’s no doubt that this will be a popular car and prices for the 2016 Range Rover Evoque start at £30,200 OTR and it comes with a lots of standard kit including heated and adjustable front seats, lane departure warning, automatic headlights and powered door mirrors. There’s also autonomous emergency braking, automatic climate control and rain sensing wipers. Land Rover have also announced that the service intervals in its TD4 Range Rover Evoque have been extended to 21,000 miles from 16,000 miles which should help reduce running costs. This entry was posted in 4X4 Car, Car Leasing, Cars, Luxury Cars and tagged lease a range rover, new range rover evoque, range rover evoque by Steve Lumley. Bookmark the permalink.